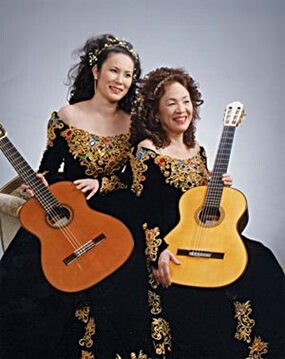 The 5th annual Pattaya Classical Guitar Festival will once again showcase many of the region’s finest classical guitar players including this year the diverse talents of two female Japanese guitaristas, Yoko Fujimori and Shinobu Sugawara. The pair founded the Maria Duo in March of 2003 and the title “Maria” actually stands for the initials taken from three Japanese words, Magokoro (genuineness), Risou (ideal), and Ai (love). These words embody the essence in which these two ladies play the guitar, i.e. “to play the guitar with joy, to give thanks to friends and to life which brings so much happiness, and to play with modesty, genuineness and love”. Yoko Fujimori and Shinobu Sugawara – the Maria Duo. The duo’s concerts are rather distinct from ordinary guitar performances. Their concerts include conversations and lectures based on these two ladies’ everyday experiences. Their talks often invite laughter, but also tears as well. Other aspects that are not the norm of a guitar concert are ukulele, recorder, and percussion performances and even singing and dancing. These out of the ordinary concerts, filled with excitement and energy, offer a relaxed atmosphere that is not found in others performances. Those who have seen the duo perform comment that their concerts bring more than guitar music on to the stage. The duo is especially well received by the women of various age groups, and often gets specific request for a recital with a lecture that discusses a theme based on a women’s point of view. Joining Yoko and Shinobu at the Pattaya Classical Guitar Festival this coming weekend will be a star line-up of world class musicians from around the globe. The Festival takes place on Sunday, October 27th at the Siam Bayshore hotel in Pattaya starting with the junior competition at 9 a.m. and will culminate with a ‘Guitar Night Concert’ at 8 p.m. Admission to the Festival (inclusive of coffee breaks) is just Baht 500 for adults and Baht 400 for students (with valid I.D.). Tickets are on sale at the Siam Bayshore, Pattaya. Call 038–428–678 for purchasing or e-mail [email protected] or to learn more about this event, visit www. thailandguitarsociety.com. Proceeds from the festival will go to the Father Ray Foundation, a non-profit organisation that takes care of 850 orphaned, abused and disadvantaged children and students with disabilities.